Real Madrid have announced that they have exercised their option to buy back Alvaro Morata from Juventus for €32m. The 23 year old Morata started in Real Madrid's youth program seven years ago and is one of the rare ones that made it all the way to the first team. He there struggled for desired minutes with Karim Benzema and Gonzalo Higuain ahead in the pecking order. Even though there was no shortage of suitors willing to pay a high price for the young striker, it was decided that it would be best to send Morata to Juventus for a relatively small fee of €22m, but with a contract clause that enabled a buy-back. The time spent in Turin did Morata the world of good and only two years later he is considered to be one of the top strikers in the world. 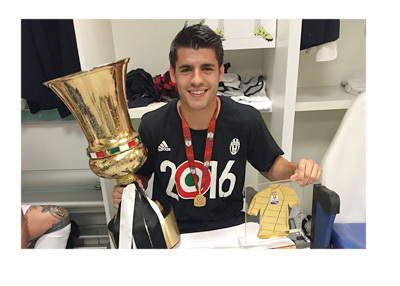 Morata always had it in him to become a big player. He popped on the scene in 2011 with a dominating performance at the 2011 UEFA European Under-19 Championship in Romania, where he helped Spain win the title by scoring six goals. The Euro 2016 has so far been good for Morata, who is one of the main players on the Spain's national team. He has scored three goals and is, at the time of this writing, a joint top scorer in the tournament. Will Real Madrid decide to keep Morata or pass him on to one of the English Premier League teams for a hefty fee remains to be seen.